The request for Sunday was another navigational course, so after a start near RTYC buoy the fleet beat against the tide down the north shore into the Western Solent around Craftinsure.com and across to Salt Mead before turning east for a series of zig zags gradually moving east to finish at East Bay just west of Egypt Point. There was a strong flood tide which made the beat particularly difficult as well as the reaches interesting, places were gained by careful use of transits. Buoy rounding too was an art in the east going tide. Throughout the weekend there was some very close racing with places changing during each race. Both Race 2 and 3 had very close finishes, Race 2 saw Blanco 2nd, Minstral Boy 3rd and Andaxi 4th finish within 34 seconds and that after I hour and 23 minutes of racing! Race 3 was a 2 hour 33 minute race and the first three finishes were within 1 minute 19 seconds, Blanco 1st, Andaxi 2nd then Muscadet 3rd. The weekend was won by Blanco with a consistent two wins and a second, Second place was hotly contested but won by Muscadet with one win and two thirds to the third placed Andaxi with two seconds and a fourth. 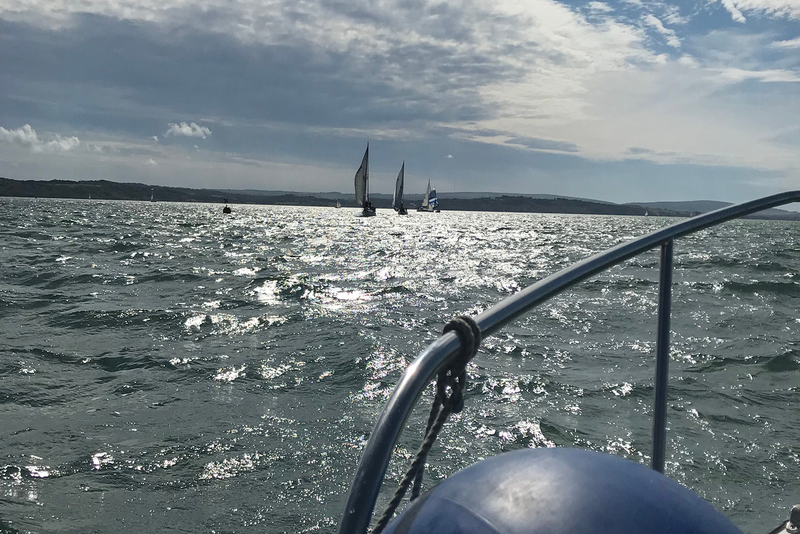 Minstral Boy scored a third and two fourths with Coh Karak a steady fifth and Equator attempting to work the tight legs just double handed got sixth place after finishing only one race, that must have been such hard work against the other five fully crewed boats. For full results, please check the results page. Well done to all the competitors, we hope you enjoyed your weekend. The RLYC looks forward to welcoming the Contessa fleet in 2019 in the 50th anniversary year. Race Officer ; Amanda Harding, assisted by Barrie Harding, Mike Batchelor, Martyn Hayward, Gary Hayden, Jack Baldwin and Laurie Tennant.